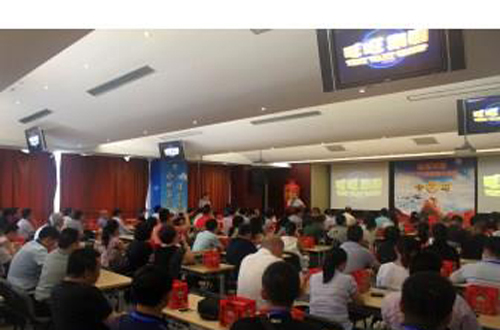 Some 100 of the registered audience from the “3rd CPRJ Plastics in Packaging Conference and Showcase 2015” visited the Shanghai headquarter of co-organizer Want Want Group on the second day (7 August) of the conference. The visitors knew about the Group in detail and understood the importance of corporate culture to a well-established enterprise in the visit. Mr Yu Huimin, Deputy Director, Production Dept., Want Want Group warmly welcomed the delegate. The details of the Group, such as history, business sectors, production sites and the level of automation, were introduced to the delegate. The delegate was specially offered the chance to visit the Center of Corporate Culture, understanding the requirement to staff, development and details of the culture of the Group. In addition, all the products of the Group were well showcased in the product showcase room. All the visitors were impressed by what Want Want Group showed them. Most importantly, the Group shed light on how important is well defined corporate culture to an enterprise which focuses on innovation and is passionate about serving its customers. The afternoon session of the conference held on 6 August was very fruitful too. In particular, the Brainstorm sections were so “hot”, with plenty of interactive discussions between industry experts on stage and the audience. Under the theme of “Smart packaging and Industry 4.0”, Mr Zheng Yubo, Secretary-General of Intelligent Manufacturing Industry Alliance, presented how industry 4.0 can help packaging industry to transform and upgrade. Mr Zheng said: “The key to industry 4.0 is integrating manufacturing with internet and digitalization, making use of different technologies to closely follow the trend of internet of things (IOT) and software development.” Besides, he also emphasized the integration of customer requirements, resources and products. Sustainability is a mega trend of manufacturing, packaging industry is not an exception. Kurt Pichlmann, Area Sales manager, Erema Engineering Recycling Machinen Und Anlagen GmbH, introduced the high-tech plastics recycling technology in the food packaging industry, and shared the experience of plastics recycling in Europe. He explained, the key benefit of using high-tech equipment for recycling for the film producers, is high return due to saving of virgin material. Meanwhile, the demand of functional packaging is rising rapidly. Ms Li Minwen, Manager, Research Center, Unlimited Extremely China Co., Ltd., introduced the latest development of function packaging in the afternoon session. She remarked that consumers are willing to pay more for functional packaging as they care more about the experience of using a product. For the technology development, Ms Li said that sustainability, anti- counterfeit, easy to use and high barrier packaging are the main trends. he “3rd CPRJ Plastics in Packaging Conference and Showcase 2015” was co-organized by CPRJ China Plastic and Rubber Journal and Want Want Group.